Figure 1. Left brachial artery to axillary vein AVG. Note the graft in orange and the outflow vein in blue. The arrow demonstrates the site of venous anastomosis stenosis. 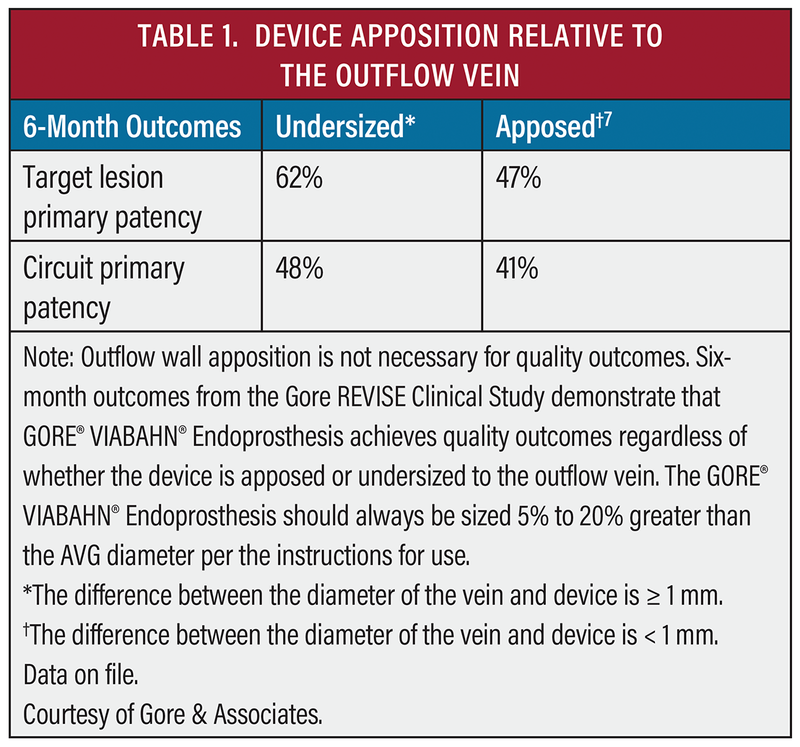 This article presents a case of venous anastomosis stenosis, with particular attention to practical considerations in deploying the GORE® VIABAHN® Endoprosthesis at the venous anastomosis of an AVG with a larger-diameter outflow vein. Figure 2. Angioplasty performed with an 8 mm x 8 cm balloon at the venous anastomosis. Note the waist seen at the junction of the venous anastomosis and outflow vein prior to full balloon effacement. A 60-year-old man with a history of hypertension resulting in end-stage renal disease presented with decreased clearances at dialysis. He had a left brachial artery to axillary vein 6 mm expanded polytetrafluoroethylene (ePTFE) AVG placed 1 year prior to presentation. Six months earlier, endovascular thrombectomy with angioplasty at the venous anastomosis was performed at an outside institution. He presented to our center with a recent history of prolonged bleeding after needle removal at dialysis (> 20–30 minutes) and elevated venous pressures on dialysis. Upon clinical examination, a pulsatile graft was present. 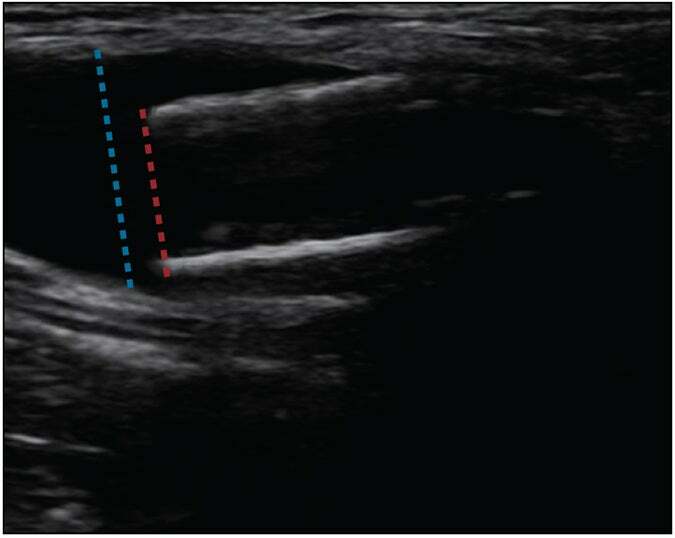 A preprocedural Doppler study suggested a stenosis at the venous anastomosis. Of note, the draining axillary vein proximal to the anastomosis measured 9 to 11 mm in diameter. Figure 3. Recoil at the venous anastomosis postangioplasty. An angiogram revealed a high-grade stricture at the venous anastomosis of the graft (Figure 1). 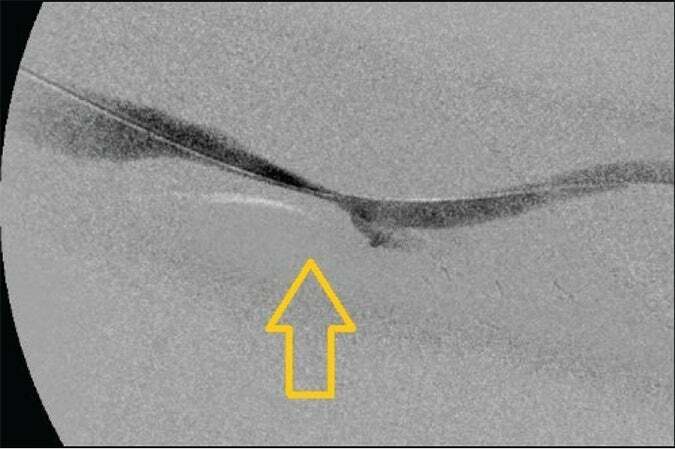 An 8 mm x 8 cm BARD® VACCESS® Angioplasty Balloon was used to dilate the venous anastomosis of the graft, with a waist noted at the venous anastomosis before full balloon effacement (Figure 2). After angioplasty of the lesion, ongoing significant recoil remained (Figure 3). Given the data supporting advantages of stent graft placement over balloon angioplasty at the venous anastomosis, as well as with recoil postangioplasty, the decision was made to place a GORE VIABAHN Endoprosthesis at the venous anastomosis stenosis.4 After dilation with balloon angioplasty, the graft measured approximately 7 mm in diameter, so an 8 mm x 10 cm GORE VIABAHN Endoprosthesis was deployed at the venous anastomosis lesion and further postdilated with the 8 mm balloon (Figure 4). Postprocedure, the patient regained a strong thrill in the access. Venous pressures and clearances improved at dialysis, with bleeding times at less than 5 minutes after needle removal. At 6 months postprocedure, the patient has required no further interventions and maintains access use at dialysis. Angioplasty remains a key component of venous anastomosis lesion management. The challenge of angioplasty here is the need to manage the difference of diameters between the graft and the outflow vein. In our practice, we often see 6 mm straight ePTFE used for AV access grafts. The draining outflow vein size can be variable, ranging from 5 to 6 mm to 14 mm or larger; this is contingent on the ability of the vein to further dilate after AVG placement. In general, we tend to see larger-diameter draining veins proximal to the venous anastomosis. Figure 4. Deployment of an 8 mm x 10 cm GORE® VIABAHN® Endoprosthesis at the venous anastomosis (A, B). Note the extension of the proximal edge into the draining axillary vein. 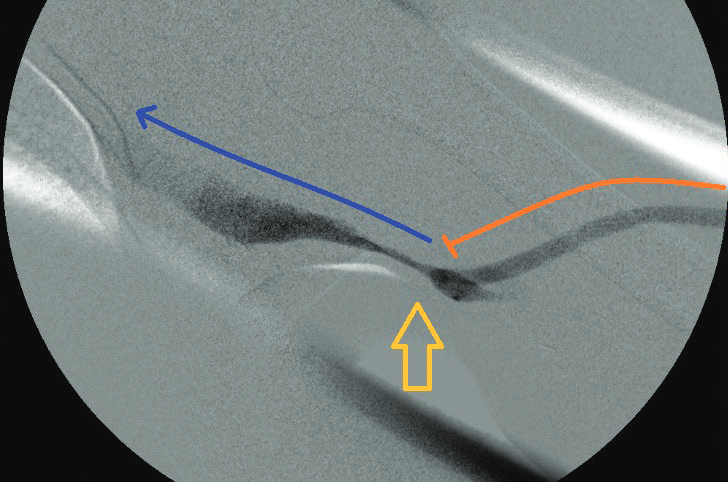 Representation of the GORE® VIABAHN® Endoprosthesis (orange) with the proximal edge floating into the larger-caliber outflow vein (blue) (C). Figure 5. Depiction of venous anastomosis GORE® VIABAHN® Endoprosthesis placement at a larger-diameter outflow vein. Our approach to balloon angioplasty sizing targets matching the diameter of the larger outflow vein. For 6 mm ePTFE grafts, we usually treat the venous anastomosis with a 7 to 8 mm percutaneous transluminal angioplasty (PTA) balloon. Although the balloon size is larger than the 6 mm ePTFE segment, we have noted no significant ePTFE dysfunction with using 8 mm balloons at the 6 mm ePTFE graft. This is due to the elastic nature of the ePTFE material. When the vein is larger (9–12 mm in diameter), we use 8 to 9 mm PTA balloons. We have limited the use of larger 10 to 12 mm diameter balloons at 6 mm grafts, with concerns for potential graft trauma with larger-diameter balloons. The general concept is to dilate the site of stenosis as large as possible, without unnecessary trauma to the graft. We also encounter bovine grafts and tapered grafts with venous anastomosis lesions. Although the bovine grafts have the ability to dilate and expand over time, we have been cautious with significantly oversizing PTA balloons at the bovine graft material, with concerns of damage to the bovine graft segment. In these cases, we generally avoid balloon dilation > 2 mm over the graft diameter at the venous anastomosis. When considering 4 to 7 mm tapered AVGs, we generally approach angioplasty with an 8 or 9 mm PTA balloon at the 7 mm venous anastomosis. We follow the diameter selection guidelines found in the instructions for use, which recommend oversizing the device 5% to 20% to the size of the target vessel. We generally anchor at least 2 to 4 cm of the GORE VIABAHN Endoprosthesis within the graft and allow the proximal end to freely float in the outflow vein (Figures 5–7). Proper device oversizing and landing zone selection within the graft combine to securely anchor the distal segment of the GORE VIABAHN Endoprosthesis within the graft while maintaining proper flow dynamics. Choice of stent graft length is essential to success in long-term venous anastomosis treatment. The goal is to create an outflow conduit that will decrease future neointimal hyperplasia development. Attention must be paid to the desired location for the proximal edge of the stent graft. Placement of a stent graft at the venous anastomosis creates a new, more proximal (central) venous anastomosis. The proximal edge of the newly placed stent graft becomes the “new” venous anastomosis of the graft. This may instigate development of upstream neointimal hyperplasia, with the more proximal draining vein now in closer proximity to the high flows from the access. Figure 6. Doppler image of the proximal edge of an 8 mm GORE® VIABAHN® Endoprosthesis floating in a larger-caliber outflow vein. As described in the case, we identify larger-diameter veins proximal to the venous anastomosis. A stent graft serves as a conduit leading from the graft through the site of venous anastomosis stenosis and neointimal hyperplasia to the larger-diameter outflow vein. This allows exclusion of the neointimal hyperplasia from the access while providing long-term radial support at the site of stenosis. The overall goal is to create a bypass from the graft to a healthy, suitable vein. A longer-length stent graft (10 cm) was necessary in this case to create a conduit to the larger axillary vein. Figure 7. 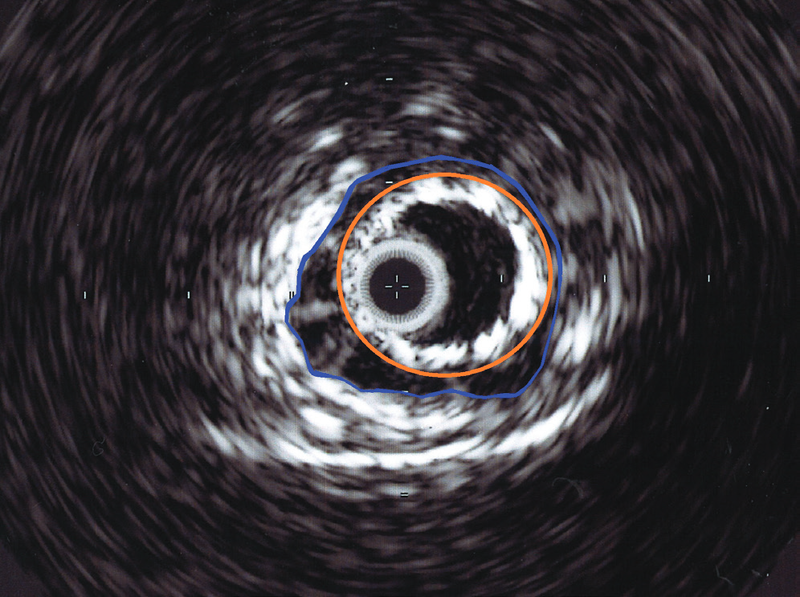 Intravascular ultrasound image of the proximal edge of an 8 mm diameter GORE® VIABAHN® Endoprosthesis (orange) floating in a 12 mm diameter outflow vein (blue). To minimize future issues of edge stenosis and neointimal hyperplasia development at the draining vein, the proximal edge of the stent graft should have minimal venous vessel wall contact. 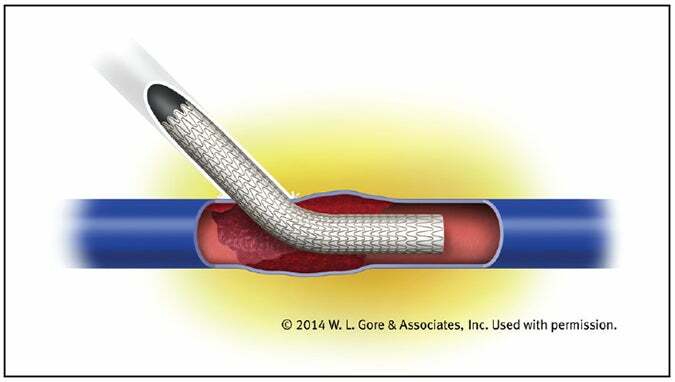 The goal is to deploy the proximal edge of the smaller-diameter stent graft within a larger-diameter outflow vein. This “elephant trunk” technique allows the GORE VIABAHN Endoprosthesis to lie in the outflow vein without vessel wall apposition. Figure 8. Right upper arm brachial-axillary AVG with high-grade venous anastomosis (A). The patient was treated with angioplasty and placement of an 8 mm x 5 cm GORE® VIABAHN® Endoprosthesis at the venous anastomosis (B). A small venous valve was seen at the time, with no interference with access flow (purple arrow). Four months later, the patient presented with elevated venous pressures. A high-grade stenosis was seen at the site of the venous valve (C). This stenosis was further treated with a second 8 mm x 5 cm GORE® VIABAHN® Endoprosthesis (D, E). One year later, the graft remained patent with no further intervention necessary (F, G). Findings from the Gore REVISE Clinical Study further support the advantages of undersizing the proximal edge of the GORE VIABAHN Endoprosthesis. A > 1 mm difference in vein diameter between the stent graft and the larger-diameter outflow vein resulted in higher 6 month patency (Table 1). In the case presentation, the proximal edge of the GORE VIABAHN Endoprosthesis was placed at the large-caliber draining axillary vein. This bypassed areas of luminal narrowing and stenosis, creating a direct conduit from the graft to the large-caliber outflow vein (Figure 4C). 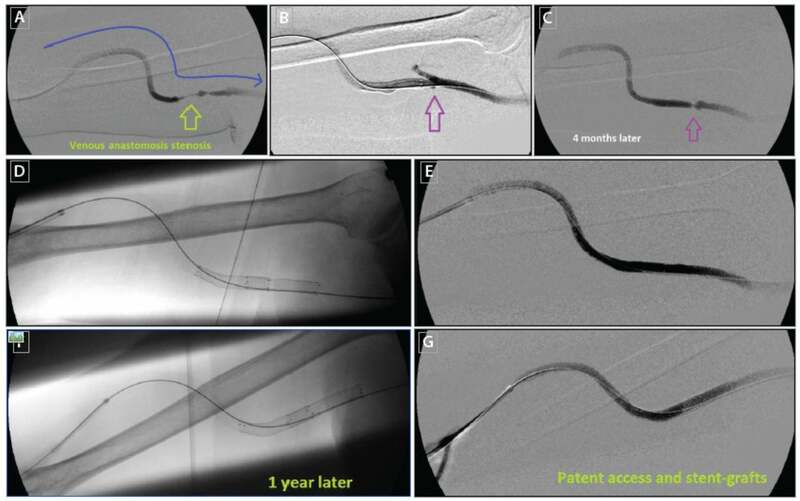 The smaller-diameter outflow vein segments were excluded from the stresses of the higher blood flow from the graft, effectively reducing the risk of future stenosis development. The relative undersizing of the proximal portion of the stent graft allows for permissive mobility of the stent graft within the larger-diameter outflow vessel. This undersized proximal part of the stent graft has minimal contact with the vessel wall (Figures 6 and 7). Figure 9. Computational flow dynamic studies of wall shear stress at four representative time points of the cardiac cycle: without wall apposition (A) and with wall apposition (B). 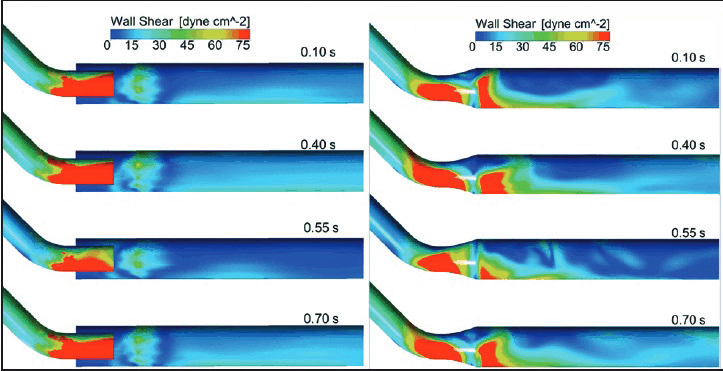 Note higher shear stresses (red) at outflow vessel when wall apposition is present. Reproduced from Ross JR. Stent-graft sizing for AV access creation and revision procedures. Endovasc Today. 2014;13(6 suppl):21. As a flexible device with full end-to-end ePTFE lining, the GORE VIABAHN Endoprosthesis is unique in its ability to treat venous anastomosis lesions. The self-expanding support allows for maintained patency at this site of recurrent stenosis. A key feature is the ability of the GORE VIABAHN Endoprosthesis to stay dynamic and flexible within the larger-caliber outflow vein. This flexibility minimizes risks of kinking and access thrombosis as the device follows the natural ability of vessels to bend and contour with the body. In this case, we undersized the diameter of the stent graft to a larger outflow vein, minimizing the risk of future stenosis and helping to maintain long-term access patency. The patient previously had an episode of graft thrombosis but has remained intervention-free over 6 months after stent graft placement. This has been a revolution in managing dysfunctional AVGs, providing for improved access outcomes and quality of care in the end-stage renal disease population. Lynch JR, Wasse H, Armistead NC, McClellan WM. Achieving the goal of the Fistula First breakthrough initiative for prevalent maintenance hemodialysis patients. Am J Kidney Dis. 2011;57:78-89. Haskal ZJ, Saad TF, Hoggard JG, et al. Prospective, randomized, concurrently-controlled study of a stent graft versus balloon angioplasty for treatment of arteriovenous access graft stenosis: 2-year results of the RENOVA study. J Vasc Interv Radiol. 2016;27:1105-1114. Vesely T, DaVanzo W, Behrend T, et al. Balloon angioplasty versus Viabahn stent graft for treatment of failing or thrombosed prosthetic hemodialysis grafts. J Vasc Surg. 2016;64:1400-1410. Patel DV. Case report: endovascular salvage of an abandoned AV graft. Endovasc Today. 2017;16(6 suppl):22-26. Kim CY, Guevara CJ, Engstrom BI, et al. Analysis of infection risk following covered stent exclusion of pseudoaneurysms in prosthetic arteriovenous hemodialysis access grafts. J Vasc Interv Radiol. 2012;23:69-74. Ross JR. Stent-graft sizing for AV access creation and revision procedures. Endovasc Today. 2014;13(6 suppl):17-21. Van Tricht I, De Wachter D, Tordoir J, Verdonck P. Comparison of the hemodynamics in 6 mm and 4-7 mm hemodialysis grafts by means of CFD. J Biomech. 2006;39:226-236. VanBavel E. Effects of shear stress on endothelial cells: possible relevance for ultrasound applications. Prog Biophys Mol Biol. 2007;93:374-383. Disclosures: Medical advisory and speaker fees from Gore & Associates.